Do you ever get bogged down with little daily decisions? Deliberating back and forth about two options takes up a lot of valuable head space that you can’t always spare. Forget about pondering over things in your already bogged-down mind. For easy(‘ish) decisions, nothing quite beats a good old Pros and Cons list. Don’t write it off as being too simple to work. You may be pleasantly surprised! The next time you recognise that you’re playing a decision back and forth in your mind, whip out a piece of paper, draw a line down the middle and put the pros and cons into two columns. When one column easily outweighs the other, voila! There’s the answer. Of course the sheer number of reasons in one column doesn’t always outweigh one major reason in another. This is when it’s good to get clear about your values and what’s truly important to you. Decisions made from the heart usually feel better than ones made only with your head. Last summer I needed to make a decision about having our cats looked after while we went away for two weeks. Our normal cat sitter wasn’t available and they’ve never gone to stay in a cattery before, so I wasn’t too keen on that option. Our vet told me that her intern student from Austria was looking for accommodation for a month. If she stayed with us, she’d be here over the two weeks we’d be away – as well as two weeks while we were home. The decision over whether to do this or not began playing on repeat in my mind and as the date grew closer, it was beginning to stress me out. When I realised this was going on, I sat down and whipped up a Pros & Cons list. Should the vet student come to live with us for one month? So the Pros list was longer, but the Cons list was meatier. Seeing it right there in black and white made me realise what I could do. I asked the vet for the student’s email and then contacted her. She sounded absolutely lovely in her mail and she also sent me glowing references. I immediately felt better about this option. Then – eureka! I thought of a friend who was going away too and sending her dog to a kennel. Her family were travelling during the two weeks before we were and she leaped at the idea of having someone stay with their dog instead of kennelling her. A quick no-brainer for her. The vet student went to my friend’s house for the first two weeks and ours for second. She turned out to be wonderful! We went away with complete peace of mind – and we’ve made a new friend in Austria! Sometimes decisions come down to our core values. Several years ago Christmas was coming up and I was pondering gifts for my two boys. We didn’t have any kind of games console – Wii, Playstation – nada. I’m not a fan of this stuff. Board games all the way, baby! They were beginning to make noises about wanting a Wii as they’d played it with friends. I was feeling really torn about the whole thing. They will freakin’ love it. It solves the dilemma of what else to get them. Other kids their age have it. They will feel part of the crowd that can talk about this stuff. It might take them away from board games and other creative play. I just don’t like this kind of stuff! They can always play it at friends’ / cousins houses so need to own one. I feel like I’d be getting this just because it solves the problem of what to get them that they will love. I get great joy out of seeing their eyes light up on Christmas morning. I know they would be over the moon. But… it goes against my values. I have a thing about kids and video games. I know they will eventually get one, but can they hold off for another year, play with their toys and board games, use their imagination a bit longer? I knew in my heart what the answer was. I needed to stick to my values and re-address the issue next year. Whew – decision made! It seems some decisions are just out of our hands. Do you ponder decisions in your head? Stop that right now! Write out a Pros and Cons list to get it out of your head and onto paper. Your busy brain has too much to process on a daily basis and you owe it to yourself to do this. Maybe your Pros & Cons list won’t instantly solve the dilemma, but you can’t know until you try. Share your thoughts about this. 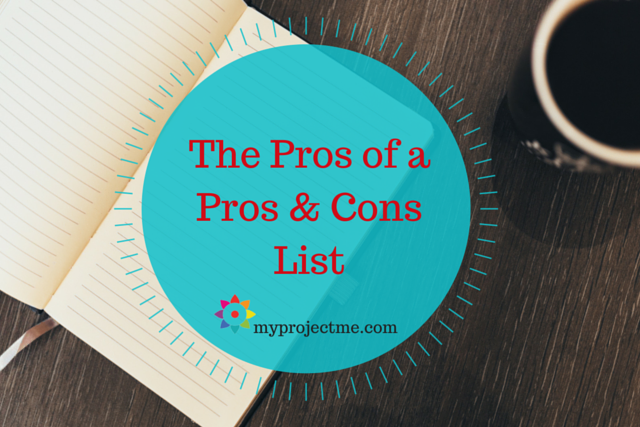 Are you a fan of Pros & Cons lists and making decisions on paper? Has this inspired you to start doing it? Is there anything you’re trying to make a decision about right now? Hash it out right in the comments below! OK, here it goes, and I’m sure this is going to all sound very silly to others, but all weekend I’ve been deliberating over something and yes, it’s taking up too much brain space for sure. I need to just make a decision and move on. It’s my daughter’s birthday party next Saturday here at home. My younger daughter has been invited to a party the same day. It feels wrong for her to miss her sister’s party (they are just 18 months apart.) But she’s been struggling socially and I’m so relieved she’s been invited to a party! I’ve asked her which one she wants to go to, but I did lead her more towards choosing her sister’s party. She needs her own friends and not to live in her sister’s shadow. I will have to leave our party to drive her there and pick her up. Logistically hard! ok so seeing it all here in writing does help because I now see that some of these points I don’t know enough about – like I have not asked my older daughter if she would mind, maybe she wouldn’t and so that’s an invalid point until I know. And I also don’t know who else is invited to the other party so maybe I can ride share with another family. And I think the lack of a gift is silly because I can order an Amazon voucher easily. I now feel in a better position to get the missing details I need to make this decision (together with my girls, instead of alone in my head). Thank you Kelly! You’re right about needing to write stuff down as I can make better sense of it that way. It’s amazing how much stupid head space this has been consuming! It’s very funny for me too to have received this email today. I’ve been deliberating over something extremely important, it’s been in my head for the past two weeks and this morning I woke up with a big lump in my throat because I know that is time to make the decision. Then I did as you suggested Kelly, which gave me a bit more confidence on my final decision! I usually recommend this for easier decisions, as I know huge life decisions can need more heavy artillery than a simple pros & cons list. HOWEVER, the process of writing down anything that requires a decision is incredibly powerful itself and brings clarity. A few months back my hubby and I had a HUGE decision to make over our move back to London and which schools the boys should attend. We went to a local restaurant so we could talk without the boys overhearing us. Of course I took along a notepad and pen…. I made a page for each of the three choices and we began writing our pros and cons for each one. Suddenly my hubby came up with a fourth option we hadn’t considered, which is what we ultimately went for. I really don’t know if we’d have sorted it out so easily without sitting down together (with pen and paper!) and focusing on a solution. Thank you Kelly! The decision was made, whether is the right one only time will tell, but I feel as if a big stone has been taken away from my chest!